3 BR - 2 BRs sleep 2, 3rd sleeps 1, 1 full bath. 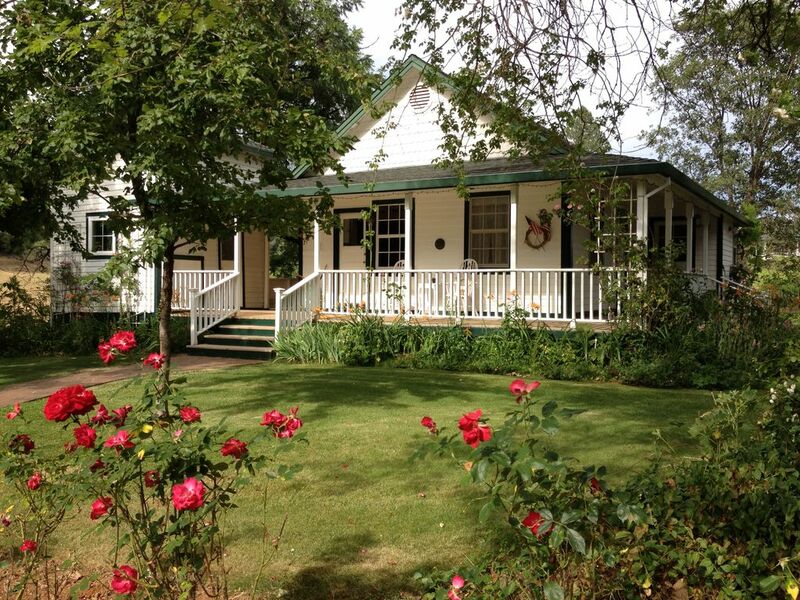 Our rental is a charming 1893 cottage in a 7 acre Cabernet Sauvignon vineyard.We are 1/4 mile off Hwy 140, 35 to 40 minutes to the El Portal entrance to Yosemite. The house is furnished in a Victorian style. A porch, large deck, and a great cedar tree provide delightful areas to relax & dine. For 1 or 2 couples, or a family, it is a great hideaway to return to after a day of visiting Yosemite, or the local attractions. We provide the making for a continental breakfast for your first morning, as well as a bottle of wine we make from our vineyard. Please note that the Sierra Foothills get virtually no rain from mid May until October. We also are Bug Free - enjoy bug-free evening on the deck, porch, or under the cedar tree. In addition to seeing some of the most spectacular scenery in the world, while visiting Yosemite you make hike, swim, fish, or rent a raft for a lazy float on the Merced River. You can also white-water raft on the Merced River in the Merced River Canyon,, or take a rock climbing lesson. Mariposa is the southern end of the Sierra Gold Country and has a History museum, and the State Mineral Exhibit. Historic downtown Mariposa offers shopping, restaurants, and wine tasting. PLEASE NOTE: $150 is for 2, $15/person for each additional person. Our cottage is on an 80 area property. The cottage, our home, the caretaker cottage, and the vineyard are on a 14 acre parcel that is fenced in with a seven foot deer fence. We live on a paved County road 1/4 mile off Highway 140, the all weather entrance into the Park. When you leave our cottage to go to Yosemite, this highway takes you through the Merced River Canyon; where, depending on the season, you will see white water rafters, raging waters, beautiful fields of wild flowers, or lovely fall color. Yosemite's beauty can be seen in the towering granite cliffs, the spectacular waterfalls, the giant Sequoia and Ponderosa, and fields of wild flowers, or it can be a winter wonderland. When you visit the Valley, you may want to use the free shuttle buses to see all of the Valley sights. You can get off to walk to the base of Yosemite or Bridal Veil Falls, or perhaps to hike up to Vernal and Nevada Falls. The Valley has Park Ranger programs, a museum, book store, and the Ansel Adams Gallery The Village Store is a grocery and variety store. Numerous food services are available from fine-dining at the Ahwahnee Dining Room to cafeterias at the Yosemite Lodge and Curry Village. You can go horse-back riding, or rent a raft to float lazily down the Merced River. Since the Valley is a small part of a Park that is approximately the size of the state of Rhode Island, you may want to visit the Wawona Hotel and the Mariposa Grove of the Giant Sequoia at the south end of the Park. You may even want to play golf on the Wawona 9-hole golf course. If time allows, you could drive into the High Country. Take a picnic lunch, and drive to Glacier Point for a spectacular view of the Valley, Half Dome, and the towering peaks in the Back Country. Or you may drive up to Crane Flat and take the Tioga Pass Road, stopping at the various turnouts to see the northern part of the Park, and enjoy a picnic. You can stop at Tenaya Lake to enjoy the view while you picnic, sun bath, and swim in the icy cold lake. Tuolumne Meadows has limited food service, wonderful meadows to explore, and you may even want to dine at Tuolumne Lodge before returning to your retreat in the vineyard. Whether you take a drive toward Glacier Point or Tuolumne, you will fine many hiking trails. Our cottage is on the edge of a wine grape-vineyard. We have 6 acres of Cabernet Sauvignon grapes, and 1 acre of Sangiovese wine grapes. We are not a bonded winery, but sell our grapes to wineries. We keep a small amount of grapes to make our own wine. Our grapes have been used to make gold-medal-winning wines in the price range of $15 to $45. Depending upon the time of your visit, you may see us pruning, training, or harvesting the grapes. If we are home during your stay (we usually will be), we would love to take you on a 'tour' of our vineyard. If you chose to spend time locally, we have many interesting sights to visit. Mariposa is the southern end of the Sierra Gold Country. The California State Mineral Exhibit is a great stop to see some truly beautiful minerals. The Mariposa History Museum has a changing exhibit of the interior of 49er stores and houses. There is a gold-stamp mill that was used to crush gold ore, the first step in refining the ore. A tour of the County Courthouse, the oldest in California, is great fun. You can go gold panning, wine tasting, ride a zip line, play golf at three nearby 9-hole golf courses. Historic downtown Mariposa offers fun gift shops, numerous restaurants including California Cusine, Mexican, Chinese, Pizza,a Sports Bar, and more. Perhaps you will want to spend some time at your cottage, relaxing under the Cedar tree, on the porch, or the deck. You can spend hours watching the Hummingbirds and Orioles feeding at our bird feeder. There are many other birds to watch such as Bluebirds, Barn Swallows, Robins, and Red Tailed Hawks. Be sure to allow plenty of time to view the night sky. On a moonless night the Milky Way is truly unbelievable. You may be lucky and see a meteor shower, or the Moon rise or set. We also have spectacular sunsets. We live in a house in the vineyard, approximately 300 feet from the cottage. There is also a caretaker living on the property. We will respect your privacy; however we, or the caretaker will be available to answer any questions you may have, and give you suggestions on what to see and do. Mary Lou was born and raised in Yosemite Valley, and knows the Park extremely well. Cliff is a retired aerospace project manager. Mary Lou and Cliff were married in Yosemite in 1966. They retired to the property in 1997. The property the cottage is on was bought by Mary Lou's parents in 1959. Mary Lou and Cliff took over the property in 1989, and planted the first 5 acres of the vineyard in 1992. They retired to the property in 1997, and built a house in the middle of the vineyard. They have used the cottage as a guest house every since. Now they have decided to share this special place with others. They sell all of their grapes, except enough to make a couple barrels each year. We have spent weekends and vacations in this cottage since we were married. Mary Lou's parents built a house on the adjoining property and retired there in 1971. All four of our children first stayed in it when they are 6 to 8 weeks of age. It was a very special place to visit Grandma and Grandpa. When Mary Lou's parents had the property, they raised a few head of cattle, so the grandchildren got to help with the roundup and branding. Now they help us make our wine, including stomping the grapes! Our Grands think that is great fun. Three miles from town, at the edge of a wine grape vineyard. Merced River is in a Canyon about 8 miles from the cottage. Electric heat in living room and dining room. Ceiling fans in living room and bedrooms 1 and 2. Table in dining room seat 6. There is a table, 6 chairs and two recliners on the deck, and one under the cedar tree that seats 6. We have Dish Satellite service. Large lawn in back of cottage is a great place for children to play. We have high chair available. We loved staying at the cottage, a lovely place in a beautiful setting. Fulfilled all our needs and well placed for visiting Yosemite. Thanks for your review. We are always happy to know that our guests enjoy staying in the Cottage while visiting Yosemite. The hosts were really helpful and provided a baby crib which was a big plus for us. We even got some strawberries, bread and self-made wine. This was really cool. The house itself is pretty old and has a vintage touch. So you also have to expect a TV from the 90s but that is not the main point for only 3 stars. In our opinion the cleanliness was not given. Bathroom had hair and stains from the previous renters. Carpets and floor definitely needs a makeover here and there. The terrace would be inviting if it was somehow being taken care of. Microwave and some of the tableware was also dirty. It is definitely ok for a 1-2 night stay near Yosemite though. Wow what a shock. We assume you appreciated our renting the crib and buying a sheet at your request. We were surprised when you asked us for the sheet. You said it was because you stated you were flying from Europe, and didn’t want the extra weight. Yes, our cottage is as advertised. It was built in 1893, and is fragile. However we love sharing it. When we started renting, we made the decision to not put in a upgraded TV because we knew most guests would spend little time watching it. We are so sorry you found the cottage bath and kitchen dirt! That is the first time we know of that guests have experienced it. As you know, we were not home when you arrived. Our cleaning lady brought down the goodies and wine. Usually we do that, and check to be sure all is at it should be. Not sure why the cleaning lady did such a poor job cleaning. However we are VERY puzzled that you did not come up, or email us about the problem. We came home shortly after you checked in, and you could easily had told us of the issue. Had you let us know about the problem, we would have had the cleaning lady come back. Not sure what your issues were with the deck. We arrived later than expected and they'd left the lights on, and waiting on the kitchen counter were a plate of scones, strawberries, and homemade jam. It was the perfect arrival after a long day of driving. The next morning we awoke to discover an absolutely charming little cottage, surrounded by flowers, a vineyard, hummingbirds and two wonderful cats. We were there to visit Yosemite and it was just perfect. The drive into the park wasn't too far, it was super simple and easy to navigate. The cottage itself was perfect for my husband and in-laws (and we could have put up 1-2 others as well.) The deck on the back was mandatory morning time. The Kitchen was well stocked with everything we needed to cook breakfasts and dinners. Oh, and they'd left a lovely bottle of their wine, which we enjoyed with BBQ'd ribs one night. We'd definitely return in a heartbeat. Thanks. We are happy you enjoyed your stay. We had a lovely 3 days at Cliff and MaryLous cottage. We had a lovely welcome, with information about the area, and some lovely home baked scones and wine from the grapes of Cliff and MaryLous vineyard. The cottage was very clean and comfortable, with everything you need for a visit, including tea and coffee. There was a very nice outdoor eating area, where we had breakfast and evening drinks - we loved watching the hummingbirds feeding at breakfast. It was a perfect stay. Thanks for your review. We are very happy you had a great visit! We know our guests enjoy seeing the hummers come to the feeder by the deck. We refill 4 feeders every day, and are told we have between 300 and 400 visiting every day during the summer! It was alright. Nothing majorly wrong, but I probably wouldn't stay there again. The cottage was cute and charming; filled with furniture and dishes that evoked a "simple, cottage" feel. The queen bed we slept in was really comfortable. Though, the rest of the furniture (couch, chairs, etc.) was old and uncomfortable. The dining room floor slopes toward the outside door, so the table and side board in that room were really wobbly. Since the space was so small, it was hard for two people to eat there without knocking something over. We enjoyed our stay but feel like putting a shim under the table and sideboard, updating the couch and chairs, etc. would have gone a long way to make this place somewhere you'd want to visit again. One more thing, toward the end of our stay, we realized they had been entering the (locked) cottage without letting us know, which shouldn't have happened considering they specifically state they don't have maid service. We are so sorry you didn’t enjoy our 1893 cottage. We have rented the cottage since 2012, and have had almost 300 families stay. We have received 68 Five Star reviews and 6 Four Star. If you read our guest book you know we have had visitors from all over the world, and have received rave compliments. We were shocked to see your review, and disappointed we didn’t get to meet you. We almost always meet guests who stay more than 3 days. We would appreciate it if you had told us of your concerns. Our cleaning lady told us after you left that one table leg was loose. An easy 5 minutes fix. Not sure what your concerns were about the library table next to the table. It is very sturdy, and has been used as a desk of sorts by a couple guests. We did a major remodel of the cottage in 1998. We had the kitchen gutted and enlarged. Also replace the porches and roof. The contractor wanted to correct the slope in the dining room, but we wanted it as a “truth window “. ONLY the 16 inches by the door slope, as I verified with a level. We keep the furniture in keeping with the age of the house. The rocker was loved by all 4 of our children as babies, and by many of our guests. The other chair in the living room we bought from Smith and Hawkins new for the cottage after the remodel. My wife did go into the cottage while you were there to empty the trash, which she has always done for guests who stay more than 3 days. When we meet guests staying longer than three days, we tell them my wife will empty the trash, which they all seem to appreciate. We did not enter any other time. Sorry you were unhappy with that service. Maximum # of guests is 5. Stay for 7 nights and get the 7th night for free.